Look all you want and try anyway you can, but the best place to buy Sunnyvale Hockey (or any other jersey) is HockeyDogs. Any size you wish and any name you like on your jerseys will readily be customized and delivered to you in no time. Don’t waste your efforts. 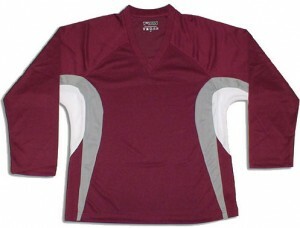 DJ100’s are solid color practice jerseys, fully customizable. HockeyDogs offers the ultimate simplest customization for any hockey player, whether individually or as a team to make an online custom orders. Many options are available (Team Name, Name, Number, Letter) that the buyer may choose. You only pay for those options you select that meet your needs. You can even buy your jersey without using any options. To order is easy and each jersey may be customized to your specifications. Please clearly explain your intentions for any modifications in the comment area of the order at no extra charge. 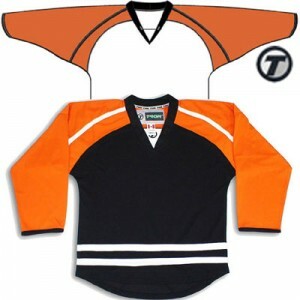 These jerseys are NHL replica DJ300, fully customizable for the players or teams. First you will select size and color of the jersey you need. Then you enter your TEAM NAME (Optional) and select the orientation for the team name (either straight across, diagonal or arc). Next you enter YOUR NAME, NUMBER, “A” or “C” if you need it and decide on the color for the lettering. You are done! That easy… When you go to the shopping cart, you will see your selection as well as stock availability for the jersey and color you have chosen.